The UK Bribery Act 2010 came into force on July 1, 2011 amid a lot of fanfare, resulting in many organizations taking steps to revamp their existing anti-corruption programmes or putting in place such programmes for the first time. Global organizations strived to ensure that they, their subsidiaries and any contracting counterparties, wherever they were located, were aware of and compliant with the Act. Many will be aware that the Act introduced a corporate offence of “failing to prevent bribery”. This offence meant that businesses were for the first time criminally liable for any acts of bribery committed by an employee or a third party who provided services for it. The Act refers to these third parties as “associated persons”. This offence, to be made out, does not require a company to be complicit in the act of bribery. In fact, the company does not even need to know it occurred to be caught. The offence does have a defence, which requires a company to show it had taken all possible measures that were proportionate and reasonable to prevent bribery occurring within the business. The Act calls these measures “adequate procedures”. This new standard has meant that the Act’s “adequate procedures” have become the benchmark for international businesses to reach when devising and implementing their anti-corruption programmes. A year on from implementation and, whilst commentators await a high-profile corporate prosecution under the Act to see its implications and the severity with which the courts will enforce the Act and impose penalties, there has only been one prosecution so far. This was a prosecution of an administrative court clerk, charged under s.2 of the Act for requesting and receiving a bribe intending to improperly perform his functions, as well as misconduct in public office. The clerk was handed a three-year sentence under the Act and a six-year sentence for misconduct in public office, to run concurrently. On appeal the sentence was reduced to four years. The SFO’s decision not to prosecute in the Oxford Publications Limited case was surprising. The SFO stated that prosecution would have been impractical because “witnesses in any such prosecution would be in overseas jurisdictions and are considered unlikely to assist or co-operate with a criminal investigation in the UK”. The SFO also considered the “difficulties in relation to obtaining evidence from the jurisdictions involved and potential risks to the personal welfare of affected persons”, considerations which could apply to many overseas corruption prosecutions. Some businesses, therefore, are questioning the time and expenses already invested or being invested in reinforcing or establishing their effective anti-corruption regime. Notwithstanding the absence of a corporate prosecution thus far, prosecutors regard the Act as a “significant weapon in [their] armoury” against bribery and corruption. The introduction of the Act has also had a preventative impact on organizations across the globe by establishing the benchmark for a proficient anticorruption programme. It is evident that, in the last two years, there has been a concerted effort by many international businesses to increase skills in the area of bribery compliance. Many businesses have reviewed their policies and procedures, and increased training in this area. Some have recruited skilled personnel to join their compliance teams. This is not just the case among UK-based businesses but also those operating outside of the UK which see the Act’s requirements as a new benchmark to meet. The UK Ministry of Justice guidance, which sets out the “adequate procedures” a business needs to meet to avail itself of a defence to the corporate offence under the Act (proportionate procedures, top-level commitment, risk assessment, due diligence, training and monitoring) is seen as setting the new international standard for an anticorruption programme. An unforeseen result of the Act has been non-UK entities (with no business in the UK) using the guidance to develop their own anti-corruption programme. The Act has forced other countries to look at their own laws. For example, Russia (usually towards the bottom of the Corruption Perceptions Index compiled by Transparency International) became the latest country to join the OECD in February 2012, reflecting its commitment to establishing an anti-bribery regime. As a result, it will need to revisit the laws it has in place. India and China are further examples of countries which are beginning to take this area more seriously. In 2011, India established a dedicated anti-corruption unit and introduced a Bill to bring in relevant legislation to combat corruption in line with international standards, including those standards imposed by the Act on UK businesses. Last year the Supreme People’s Procuratorate (SPP) of China investigated 25,000 bribery cases which involved the traditional practice of gift-giving, which, although previously acceptable, is now being investigated for abuse. China is also opening up its centralized database of bribery convictions for ease of access, and anyone discovered to be on the list is likely be disqualified for bidding on Government projects. According to the SPP, more than 600,000 inquiries were submitted in 2011. In June 2012, the Guernsey Financial Services Commission issued a consultation on changes to the Anti-Money Laundering and Combating the Financing of Terrorism Regulations and Handbooks. 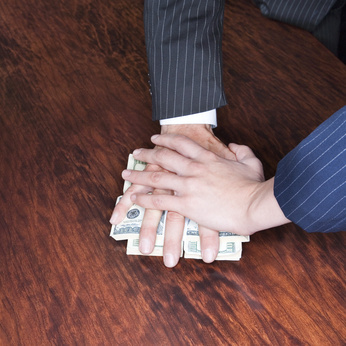 Included within the proposals was a chapter in the Handbook on bribery and corruption. The Fulbright & Jaworski 2011 Litigation Trends Survey conveys that 21 per cent of UK companies predicted changes in the way they do business due to the implementation of the Act. Twenty-five per cent of all respondents reported that they had undertaken a review of existing procedures in light of the introduction of the Act. The FSA this year also conducted a thematic review into anti-bribery controls within UK financial institutions and said almost half of the 15 banks it visited for spot inspections failed to provide an “adequate anti-bribery and corruption risk assessment”. It said it was considering referring some for further investigation and possible fines. It is clear that an increasing number of organizations and countries are taking a tougher stance on fighting bribery and corruption. In the absence of a major corporate prosecution under the Act, businesses should not be complacent. Targeting bribery has risen on the international agenda and organizations across the globe should take all possible steps now to establish an anti-corruption programme to ensure ethical practices in all parts of their business. Using the guidance issued on “adequate procedures” under the Act as a benchmark for their own anti-corruption programme is a sensible route forward.